Safety Ahead provides development, evaluation, and training primarily for the oil and gas and construction industry. With a great reputation for the best in safety .. think Safety Ahead. Creating a safe work site can be a complex task. The larger the team or project, the more challenging. With the increasing demand for health and safety programs and the change in legislation in 2018, there is more compliance required in industry mandated by the government. This means that the Occupational Health and Safety Coordinator in every company can benefit by leveraging our years of practical experience to develop the most comprehensive safety program available today. Completing a comprehensive, easy to read Safety Manual. Increasing worker confidence about what to do in event of incidents. Spending less time “fixing” site issues and spending “more” time completing projects. Building your forms manual for relevant staff to understand clearly. Creating a sense of safety to spot problem situations before they become casualties. 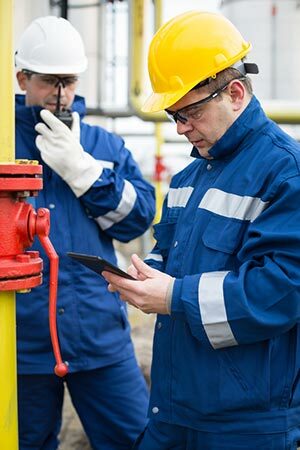 Choosing the right Safety Management Program for your business size and activity. Starting an ongoing Safety Audit routine. Taking your existing documentation to the next safety level. Generating more revenues with streamlined worker practices in place. Developing and testing new policies.